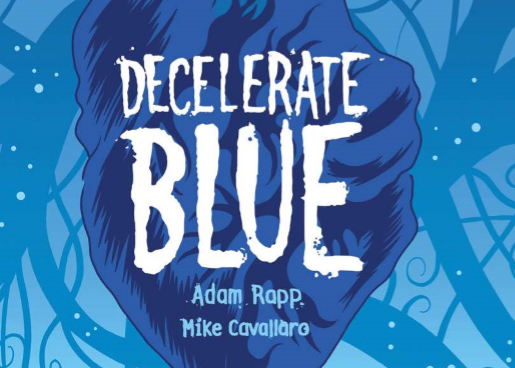 Adam Rapp and Mike Cavallaro’s graphic novel, Decelerate Blue, published by First Second couldn’t have been released at a more opportune time. Dystopian stories are seeing a renewed rise in interest lately, of which I personally believe can be thanked to the U.S.’s current political state of affairs. Just last month, Amazon reported a rise in sales for George Orwell’s book titled 1984. The seventy-year old novel became the website’s number one top seller for several days following President Trump’s inauguration and subsequent “alternative-facts” regarding Sean Spicer’s claims of having the “largest audience” of any other U.S. inauguration. Timing aside, Rapp and Cavallaro have produced a fine piece of fiction which can stand on its own. The story revolves around a fifteen-year old girl, Angela, struggling with the fast-paced, consumer-driven world that she has grown up in. In this futuristic world, people busy themselves with all manners of distraction: Mall trips, advertisements around every corner, constant consumerism, and even increasing their own heartrates while the government is able to move on its own with little disruption. The only real concern for the people is protecting your “Guarentee,” seemingly a status symbol that marks you as belonging in this “go-go” world. If the tradeoff is being able to live in relative comfort, most people are glad to accept the “Go Guarantee, Go” doctrine. The opening scene shows Angela sitting down to family dinner as her parents discuss their flavorless and non-consequential day, throwing around buzz words like “hyper” and “accelerate.” As Angela expresses a dissatisfaction with the “Megamail” and the “really hyper movies” that run around fourteen-minutes long, her parents are concerned with her dissention. As the female protagonist finds herself eventually in an underground colony of individuals who have decided to go “off-grid,” matters take on a new shade of dire for the future. In comparison to the “fastness” of the upper-world, the underground dissenters hold dear the ideals of slowness, of meditation, of slow breathing, and of living simply; everything that the “Guarantee Committee” speaks out against. What cuts truly deep about this story is that this where our society seems to be heading to now. We may not have chips imbedded in our arms, but we have cellphones that we check on average eighty-times a day. What’s to say we won’t be use to the idea of getting a tiny chip installed if it’s advertised as “timesavers” and “effortless.” There is always some product that some company is insisting we can’t live without and in turn always some technological device that we ourselves feel we could do better for if we had. This graphic novel truly is an important read, especially to that of our current generation of young adults who hardly know anything less that “instantaneous.” This is a great reminder that there are benefits to just sitting down, smelling the flowers, and perhaps taking the time in a world where there seems to be no time whatsoever to perhaps read a book. Nicholas Eskey is an avid reader and writer. When not contributing to The Beat, he works on his personal projects, the latest being a fantasy novel called “My Personable Demon.” He lives in San Diego, California, and is frequently bossed around by his cat. Might be helpful to mention it’s marketed for teens 12-17 (a so-called “YA” book). Doesn’t such omission have ironic similarity to the story’s consumerism? Heidi, my saying I found another review “more honest” only imply I found this one less forthcoming. Isn’t a review supposed to disclose when content is intended for children or teens? And isn’t your quoting the word “dishonest”, that I never used, actually harsh? Simon, thank you for reading my article. I’m sorry that I wasn’t “forthcoming” that it was written with an adolescent audience in mind. However, I firmly believe stories written for young adults still have great ideas and lessons to offer to adults as well. Take for example the books “The Outsiders,” “A Wrinkle in Time,” The “Harry Potter” series, and graphic novels “American Born Chinese,” “Bone,” and “Maus.” All of them were marked for young adults but are also enjoyed by adults alike. I guess I just don’t remember to include the tag “written for teens” because I think it could be enjoyed by everyone, but perhaps that’s my personal opinion. Sorry you didn’t agree with the review. Did you get a chance to read the graphic novel and see how it was for yourself?